1 Department of Clinical Analyses, State University of Maringá, Paraná, Brazil. 2 Department of Cell Biology and genetics, State University of Maringá, Paraná, Brazil. The parasexual cycle with parameiosis has been characterized previously by the occurrence of genetic recombination and haploidization inside heterokaryotic hyphae prior to conidial formation. The aim of current research was to characterize, through genetic and cytological analyses, an asexual development mutant strain of A. nidulans and to use it to obtain parameiotic segregants. Analyses showed the medusa phenotype of the B84 strain, whose mutant allele was mapped in the chromosome I. The heterokaryons B84(med)//G422(med+) and B84(med)//G839(brl) were formed in liquid MM+2% CM and inoculated in the appropriate selective media. Two mitotic segregant groups were obtained: aneuploids and haploid stable recombinants. Mitotic segregants, wild-types, and developmental mutants, which did not produce new visible mitotic sectors in the presence of Benomyl and which showed normal meiotic behavior during the sexual cycle, were classified as parameiotics. Key terms: parasexual cycle, conidiation mutants, mitotic recombination, haploid recombinants. The ascomycetous fungus Aspergillus nidulans, a genetic model organism extensively studied to understand mitosis, gene regulation, and mechanisms that control development and sporulation, shows the coexistence of sexual and asexual reproduction, which may be complemented by the parasexual cycle (Timberlake and Clutterbuck, 1994; Yager, 1992; Aramayo et al., 1989). Whereas sexual reproduction requires the differentiation of several specialized tissues, including the dikaryotic hyphae, sexual ascospores are produced in fruiting bodies (cleistothecia), each of which is the result of a single fertilization event (Bruggeman et al., 2003; Yager, 1992; Pontecorvo et al., 1953a). On the other hand, A. nidulans' asexual reproductive cycle involves the formation of a multicellular structure (conidiophore) and spore production (conidia). The products of several major regulatory genes, such as the bristle, abacus, medusa and stunted genes, interact genetically to control conidiophore morphogenesis. Bristle (brlA) and abacus (abaA) genes constitute key regulators of core genetic pathway and regulate conidial differentiation in A. nidulans. Stunted (stuA) and medusa (medA) genes modify development and are required for the spatial organization of the conidiophore. MedAp interacts physically with BrlAp and is required as a co-activator of abaA. Alternatively, medA mutations result in the production of multiple layers of sterigmata and of conidiophores bearing secondary conidiophores (Busby et al., 1996; Aramayo et al., 1989). The parasexual cycle may generate recombinants in fungi. The process involves anastomosis of haploid hyphae, the formation of a heterokaryon, followed by karyogamy, resulting in a diploid nucleus. After undergoing mitotic crossing-over, diploid nucleus may return to its haploid status through subsequent mitotic divisions. Parasexual recombination already has been demonstrated in several fungal species, such as A. nidulans, Beauveria bassiana, Magnaporthe grisea, and Rhynchosporium secalis (Zeigler et al., 1997; Paccola Meirelles and Azevedo, 1991; Newman and Owen, 1985; Pontecorvo et al., 1953b). The isolation of recombinant haploid conidia directly from heterokaryons, without the recovery of the diploid phase, has been described previously in the entomopathogenic fungus Metarhizium anisopliae and in a citric acid-producing strain of A. niger. Recombinant's isolation has been explained by the high mitotic instability of heterozygous diploid nuclei, with mitotic crossing-over and haploidization occurring in the heterokaryotic hyphae prior to conidial formation. The process, called parameiosis, is a variation of the parasexual cycle and plays an important role in increasing genetic variability in filamentous fungi (Bagagli et al., 1991; Bonatelli et al., 1983). Although parameiosis also has been reported in Beauveria bassiana, Trichoderma pseudokoningii, and Cephalosporium acremonium (Bagagli et al., 1995; Paccola-Meirelles and Azevedo, 1991; Ball and Hamlym, 1982), in contrast to the previous observation, the process does not seem to occur in imperfect fungi only. Actually, parameiosis has been reported recently in fungi presenting the sexual stage, such as A. nidulans and Colletotrichum sublineolum (Baptista et al., 2003; Souza-Paccola et al., 2003; Bagagli et al., 1991). In the present study, recombinant haploid segregants were isolated directly from heterokaryons formed by B84 developmental mutant of A. nidulans. B84 is a uvs mutant with abnormal conidiophore vesicles bearing multiple layers of sterigmata. Morphological alterations of B84 revealed themselves recessive in the heterozygous condition, and the mutant allele received the provisional name of medA103. Table I shows Aspergillus nidulans strains. Minimal medium (MM) consisted of Czapek-Dox with 1% (W/V) glucose. Complete medium (CM) consisted of (in g/L) glucose 10, peptone 2, yeast extract 2, hydrolyzed casein 1, and (in µg/L) inositol 4000, choline chloride 2000, pantothenic acid 2000, nicotinic acid 1000, riboflavin 1000, 4-aminobenzoic acid 100, folic acid 500, pyridoxine 500, thiamine 200, and biotin 2 added to MM. Selective Medium (SM) consisted of MM supplemented with all the nutritional requirements of the crossing strains, with the omission of one of them in each type of medium. Compact colonies were obtained in SM plus Triton X-100 (0,01%) (TSM). Solid medium contained 1.5% agar; temperature of incubation was 37ºC. * Mutant allele phenotypes. Requirements for: adenine = adE20; aneurine = anA1; riboflavin = riboA1 or riboB2; p-aminobenzoic acid = pabaA124, pabaA1 or pabaB2; biotin = bioA1; methionine = methA17 or methG1; pyridoxine = pyroA4; choline = choA1; nicotinic acid = nicA1 or nicB8. Conidia color: chartreuse = chaA1; white = wA2; yellow =yA2. AcrA1, SulA1, ActA1, and FpaB37, resistance to acriflavine, sulphanilamide, actidione, and p-fluorophenylalanine respectively; acid uric utilization = uaY9; sulphate transport impairment = sB3; galA1, facA303, and sbA3, unable to grow on galactose, ammonium acetate, and sorbitol, respectively, as the sole carbon source; suppressor of adE20 = suA1adE20; medusa mutant = medA102 or medA103; bristle mutant = brlA42; sensitivity of UV light = uvsJ1 or uvsH4. Dp (II-I) = segment from chromosome II duplicated and transposed to chromosome I, including the Acr, w and meth+ genes. **FGSC = Fungal Genetic Stock Center, University of Kansas Medical Center, Kansas, USA. General methodology has been described by Pontecorvo et al. (1953a). Diploid B84//A288 was obtained by Roper's method (1952). Heterokaryons B84//G422 and B84//G839 were formed in liquid MM + 2.0% liquid CM. Whereas B84//G839 heterokaryons were inoculated in MM, B84//422 heterokaryons were inoculated in the following selective media: MM + adenine (1.0 µg/ml) + biotin (0.005 µg/ml); MM + biotin (0.005 µg/ml) + methionine (10.0 µg/ml); MM + methionine (10.0 µg/ml) + pyridoxine (1.0 µg/ml); MM + adenine (1.0 µg/ml) + pyridoxine (1.0 µg/ml). Cleistothecia were obtained from heterokaryons, in sealed plates, after a 21-day incubation period. Location of mutant allele of the B84 strain on chromosome I was determined by haploidization of diploid B84//A288 posterior to Benomyl treatment (Franzoni and Castro-Prado, 2000; Hastie, 1970). Conidia from B84 mutant were collected with Tween 80 (0.01%) and NaCl (0.85%) (Baptista and Castro-Prado, 2002). The suspension was filtered, washed by centrifugation, and stored at 5oC in NaCl (0.85%) before treatments. Density of suspension was determined by haemocytomer counts. Aliquots of conidia suspension were spread on TSM and irradiated for UV sensitivity. UV dose rate reached 1.4 ergs.sec_1. Results represent mean SEM of 4 experiments carried out in red light to exclude photoreactivation. 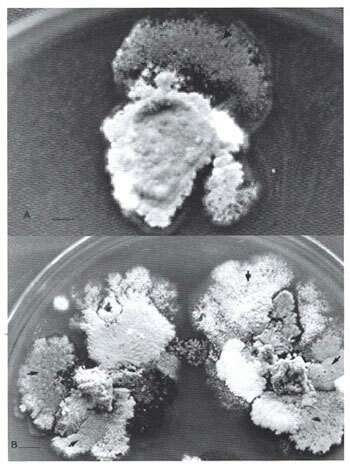 For microscopic observation of the mutant strain, spores were inoculated over a dialysis membrane supported by solidified Complete Medium, and the plates were incubated at 37°C for 24hs. After this period, dialysis membranes containing one or more colonies were stained with cotton-blue-lactophenol and examined under the light microscope. Two methodologies were used to assess parameiotic segregants from heterokaryons: 1) isolation of sectors showing vigorous growth, directly from the heterokaryons (B84//G422); single-spore colonies of these recombinants, purified in CM, were classified for conidial color and nutritional requirements; 2) Conidial suspensions from heterokaryon B84//G839 (Bagagli et al., 1991). Aliquots of this suspension were inoculated later in MM to recover prototroph recombinants. Parameiotic segregants, isolated from heterokaryons, were purified in CM and transferred to appropriate Selective Media for phenotype determination. Mitotic stability of segregants was tested in CM + Benomyl (0.5 µg/ml). Mitotically stable segregants underwent the sexual cycle. B84 uvs mutant was obtained by treatment of G514 strain with doxorubicin (Becker and Castro-Prado, 2004). Although mutant is isogenic with parental strain G514, it shows abnormal conidiophore vesicles bearing multi-layered metullae (Figs. 1 and 2). B84//A288 diploid strain (Fig. 3A) was formed and haploidized in CM + Benomyl (0.5 µg/ml) to map the mutant allele medA103. Fifty-four haploid segregants were selected, and their phenotypic analysis showed that, with the exception of linkage group I marker (yA2), medA103 assorted independently from all markers of the mapping A288 strain (Table 2). Figure 1: Conidiophore morphology of B84 (A) and A288 (B) strains. A, vesicle of conidiophore with multiple layers of sterigmata; B, normal conidiophore. The conidiophore vesicle corresponds to 10.0 mm. 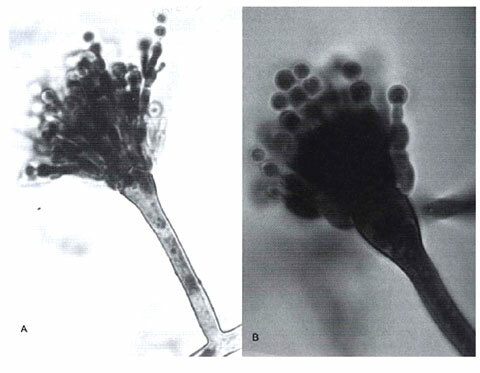 Figure 2: Survival of uvs+ (B520) and uvs mutants (G514 and B84) strains after UV radiation of quiescent conidia. Figure 3: Diploids and parasexual segregants. Arrows indicate (A) the origin of B84//A288 diploid strain and (B) parasexual segregants derived from B84//G422 heterokaryon. Bars correspond to 10.0 mm. The B84 mutant failed to produce cleistothecia in a cross with another developmental medusa mutant (B116) (results not shown). This finding has been expected because medusa mutants are self-sterile. Result in fact suggests allelism of medA102 (B116) and medA103 (B84) mutations. On the other hand, hybrid cleistothecia were obtained when B84 was crossed with A507 master strain. Since the 1: 1 Mendelian segregations in this cross were observed for the genetic markers of parental strains, this fact indicated that B84 phenotypic alterations had resulted from a change in a single nuclear gene (results not shown). Progeny analysis of this cross showed linkage between medA103 and pfaB37 alleles (Table 3). Results mapped medA103 mutant allele on chromosome I of B84 strain (Tables 2 and 3). 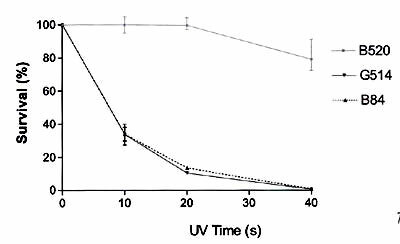 The analysis of mitotic recombination in A. nidulans has been improved by uvs (sensitive to UV light) mutations, which change the normal frequencies of mitotic recombination in diploid cells (Osman et al., 1991). Since uvsH, uvsJ, and uvsF mutations actually alter chromosomal segregation and recombination in mitosis (Becker and Castro-Prado, 2004; Baptista et al., 2003; Chiuchetta and Castro-Prado, 2002; Kafer and May, 1998), the isolation of mitotic recombinants has been facilitated in the present research by B84 (Fig 2) and G422 strains. Heterokaryons B84//G422 (Fig. 3B), obtained in MM + 2% CM, were inoculated in supplemented Minimal Media with two nutritional requirement of G422 strain without riboflavin. Twenty-three mitotic sectors showing vigorous growth were isolated from heterokaryons, purified in CM, and submitted to stability tests using Benomyl. One of them (P1) showed mitotic and meiotic stabilities and was classified as parameiotic segregant. Nine segregants were highly unstable in presence of Benomyl and were classified as aneuploid. These segregants probably were isolated during the haploidization phase by non-disjuction with chromosome losses. Each one of the remaining thirteen segregants originated a stable variant when plated on CM+Benomyl, but only five of them (P2 to P6), classified as haploid recombinants, showed normal Mendelian segregation of genetic markers when submitted to the sexual cycle (Tables 4-6). Sixty-four prototrophic segregants were obtained from conidial suspensions from B84(med)//G839(brl) heterokaryons plated onto Minimal Medium. The degree of ploidy of segregants was determined by the Benomyl test. Aneuploid and haploid segregants were obtained but no diploid colony was isolated. Thirty-one segregants exhibited mitotic stability and underwent sexual cycle with the mapping strain A288. However, only eight (P7 to P14) showed the expected normal segregation of the nutritional and conidia color genetic markers. These segregants were characterized phenotypically as med, brl, and med+, brl+, and classified as haploid stable parameiotic recombinants (Tables 4-6). The prototrophic P14 haploid segregant did not produce hybrid cleistothecia in P14 x A288 cross but cleistothecia were obtained from the P14 x P14 self-cross. Three cleistothecia of this crossing were isolated, and equal volumes of ascosporous suspensions were seeded in CM and MM so that number of segregants from each medium could be compared. Results showed lack of auxotrophic segregants and P14 meiotic stability (Table 7). The recovery of recombinants with genetic markers from both parental strains involved in crosses B84//G422 and B84//G839 proves the transfer of genetic material between the strains and thus demonstrates that parameiosis is an important mechanism for the generation of genetic variation in A. nidulans. Heterokaryons B84//G422 and B84//G839-isolated parameiotic segregants originated both through independent chromosome segregation and through mitotic crossing-over. Diploid colonies also have not been isolated from the B84//G422 heterokaryon. The great number of aneuploid segregants from both crossings (B84//G422 and B84//G839) (Table 6) is probably related to the high instability of diploid nuclei formed in the interior of heterokaryotic hyphae. In fact, mitotically unstable diploids have been detected in different fungus species and are generally associated with high frequency of haploidization and recombination (Paccola-Meirelles and Azevedo, 1991; Silveira and Azevedo, 1987; Bonatelli et al., 1983; Minut and Esser, 1983; Das and Ilczuk, 1978). The present study describes, for the first time, the isolation of parameiotic segregants from asexual development mutants of A. nidulans. Parameiosis has been proved to be an important mechanism in genetic variation generation in several fungus species and may also be deployed in the mapping of genetic markers in non-sexual fungi. Parasexual exchange of genetic information in fungi may eliminate deleterious mutations, reconstitute the genome, and generate novel variants (Sousa-Paccola et al., 2003; Zeigler et al., 1997). We would like to thank CAPES (Nucleus for Upgrading University Personnel) and CNPq (National Council for Scientific and Technological Development) for their support. Thanks are also due to Mrs. Luzia de Souza Regazzi for her technical assistance.